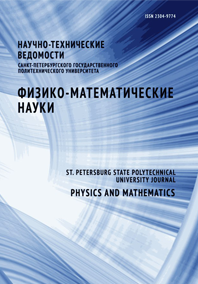 Slutsker Alexander I. Polykarpov Yuri I. Karov Dmitry D.
In the paper, the changes in the axial and the contour lengths of skeletal interatomic bonds in the chain molecules of polyethylene nanocrystals have been measured using X-ray diffractometry and Raman spectrometry. In the course of the measurements the samples were subjected to stretching and heating (mechanical and thermal actions). The measured force and temperature dependences were analyzed and the calculated description of the polymer nanocrystal’s strain was inferred from them. In so doing the original results were obtained for the thermal action. The potential energy components related to both the skeletalbond stretching and the chain-molecule bending were determined for the strained polymer crystal. The sharp distinction between the ratios of these components for the object under mechanical and thermal actions was found.